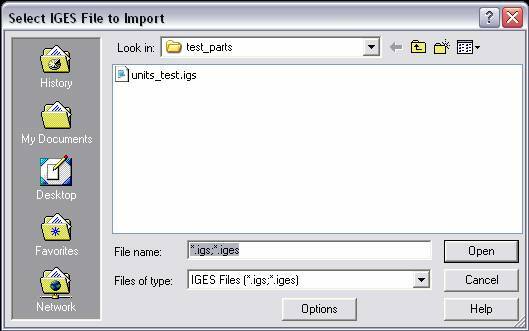 Select IGES from the File>Import submenu. The Select IGES File to Import dialog appears. Select the IGES (*.IGS) files that you want to translate. To specify how the selected file will be translated, click on the OPTIONS button. See IGES Import Options for information on what settings are available from the dialog. 3. If you have elected to specify any options, click OK to return to the Open dialog box. Select OPEN to start the translation. The Progressing… dialog will appear to display the status and entity information for the importing file. Select FINISH if the file has converted successfully.